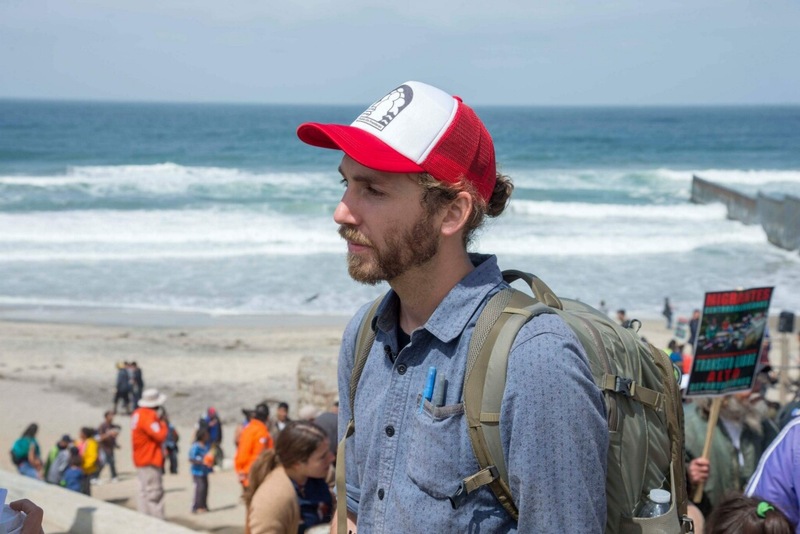 Alex Mensing is program assistant at the University of San Francisco’s Immigration Clinic and a project coordinator for Pueblo sin Fronteras—a group whose mission is to provide shelter and safety to migrants and refugees in transit. 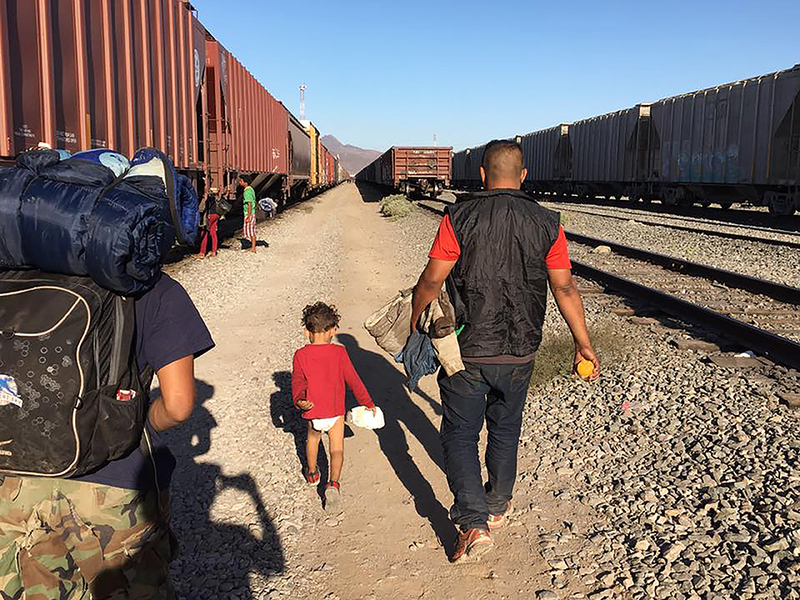 El Tecolote sat down with Mensing to talk about the issue of Central American families being separated at the U.S.-Mexico border, and what others can do to help. The following interview took place on July 6, 2018. 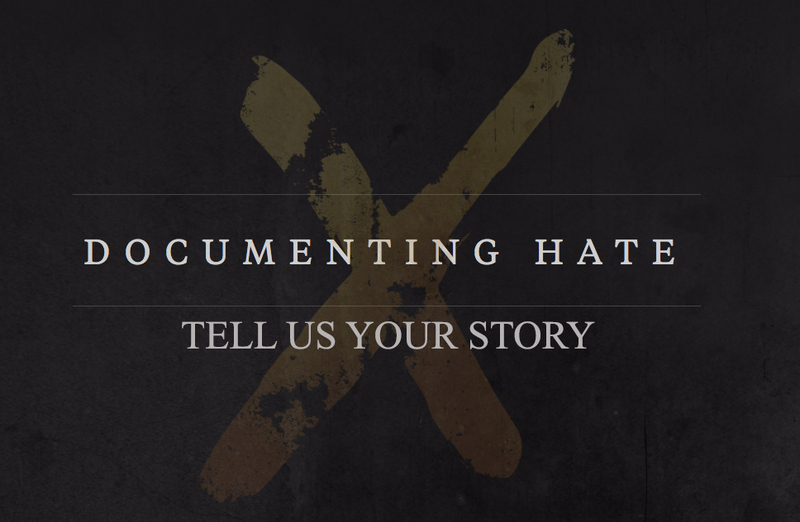 Tell us how you got your start working with Central American migrants? I started about five years ago, when I was in Mexico riding and working with Central American migrants who were on their way through Mexico. 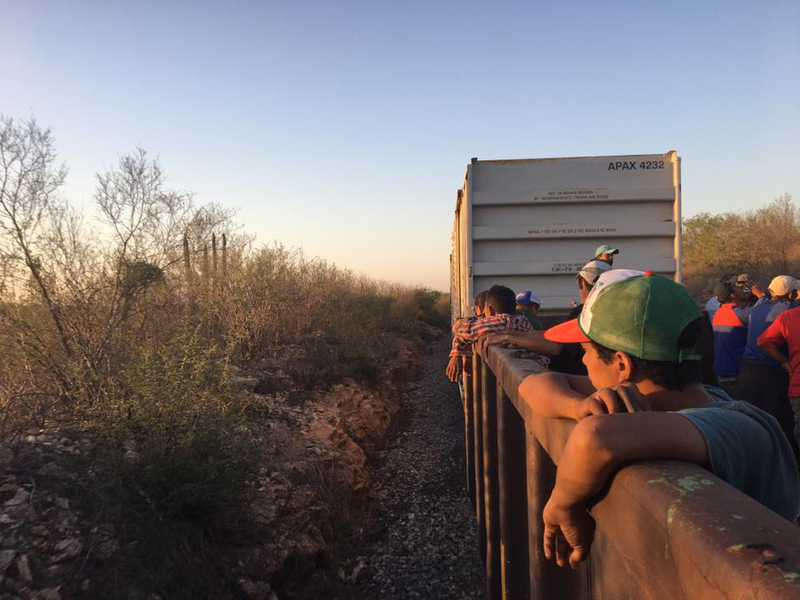 I met people who were fleeing violence in Central America. I studied a little bit of the history, of the influence of the United States on Central America over the years, and that’s what kind of led me to get more involved in immigration policy in the United States and how U.S. intervention creates the conditions that cause people to have to leave. But also then the way the U.S. government influences Mexican immigration enforcement policy, which then militarizes and then criminalizes people even more. And a lot of people from Central America end up coming and having opportunities, in some cases, to apply for asylum. So I ended up also working with Central Americans who were applying for asylum in detention, families who were in detention and that’s what got me into this and these net of people who were involved in these caravans. Last year we decided to organize a caravan that was actually planned to go from the southern border to the northern border. 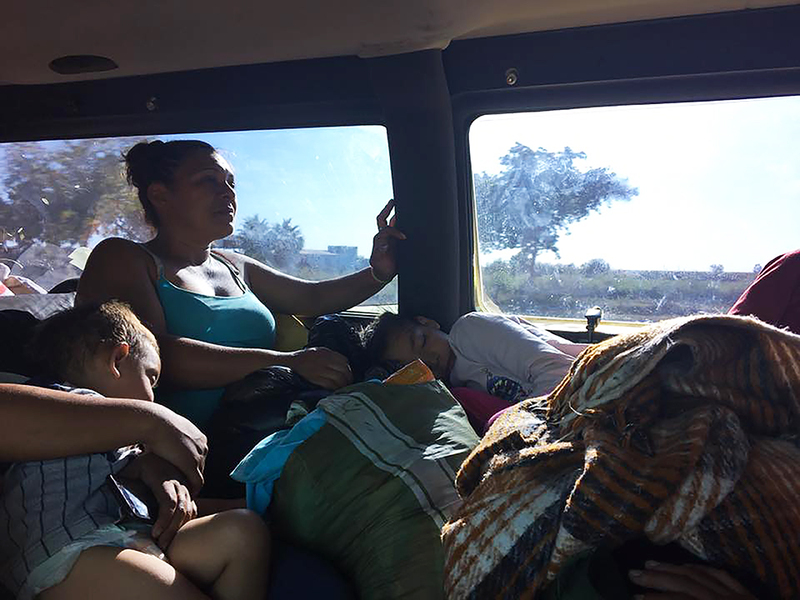 Since we followed people along the entire route, we talked to Central Americans who had recently fled Central America, we talked to Central Americans on the way through. We walk with them and travel with them. Then in the United States, many of them end up getting detained. And those are the people who have been the target of a lot of policies—both by the Obama administration and the Trump administration. Obama with family detention, and Trump with family separation—huge increase in family separation. How did you react to Trump’s zero tolerance policy? I wasn’t really super surprised by it. I think that the context is different because of the political climate right now. But various past administrations, including the Bush administration and the Obama administration, have had basically “zero tolerance” policies, although something that’s interesting about those is there’s never been a single month during which every single person apprehended at the border without documents was prosecuted. So the zero tolerance name is definitely more rhetoric than it is reality, because we don’t even have the capacity, the number of prosecutors or jail space to charge and prosecute every single person who crosses the border. On the heels of everything else that had been going on with the refugee ban and then the attention that the Trump administration gave the caravan—sending the national guard, attacking asylum policy—the idea of a zero tolerance policy, as part of an attack on what they call “catch and release,” which is an awful term for anything having to do with human beings, it wasn’t surprising. I think one of the areas where it’s been concerning, at least that I see more with my work because of where I work, is the implementation of Operation Streamline as part of that in San Diego, which is a place where they typically haven’t done that, and supposedly that started just a few days ago. There were jurisdictions or areas where people weren’t prosecuted quite as heavily even under zero tolerance policies, and the Trump administration is kind of trying to increase that. So it’s frustrating. It was primarily frustrating when combined with a policy of family separation, where the government has this insane narrative of: “If you are caught crossing the border without documents, clearly you can’t be with your kids, because you’ve committed a crime.” The idea that that’s a reasonable logical step is just completely outrageous to me. Anybody’s whose way of dealing with families crossing the border is having them be prosecuted—police taking their kids away—just needs to be removed from office. It’s completely absurd. Where do these families stand now after this executive order? Maybe it helps also to step back a little bit. The zero tolerance policy was separate from but related to the family separation policy. For those who don’t understand, immigration proceedings and criminal proceedings are totally separate. The zero tolerance policy refers to criminally prosecuting people crossing the border without papers. In truth that inspection, which is what it’s called when it’s the first time that you’ve been caught doing that, it’s literally just a misdemeanor. Oftentimes people when they’re charged and sentenced with that, they spend time in jail while they’re waiting to go to court. And they’re not even given any time. So it’s a very very minor offense, even under law that criminalizes immigration. And so that’s what zero tolerance policy refers to. The family separation part of it was kind of an addition where the Trump administration basically instructed Customs and Border Patrol agents to refer full prosecution of families that normally wouldn’t have, because if you’ve got a mom with two kids and you prosecute the mom, the mom has to go to jail. If you decide to prosecute them and put to them in jail, there’s nowhere to put the kids that are in criminal custody with the mom, because that doesn’t exist because we’re not supposed to incarcerate children. And so this really kind of messed up logic. “Well, there’s nowhere to put them so we have to take them away,” which then becomes a permanent step because they’re given over to The Department of Health and Human Services. By switching them over to this other agency, they become indefinitely separated from the parents. They’re under the custody of a different agency, they have to go through this whole other process to get reunited and that’s what was, that in combination with the zero tolerance policy is what led to, by some accounts over 2,000 by some accounts over 4,000 children being separated from their parents over the course of the last six months to a year. So, to get back to the question about the executive order, so looking at it from my perspective, it almost feels like the Trump administration essentially set people up to become outraged about something that is so egregious that then, due to the ignorance of most people about family detention, it would seem like an acceptable alternative to family separation, when really what’s happened is that we’re worse off than we were before. The executive order basically says “Okay, stop separating families.” Although it really doesn’t say that. It actually says that we will now only separate children from their parents in the event that it is determined that there’s a security reason, or an abuse involved, or we can’t determine the identity of the parents, which is already something that leads to family separations. So there are still going to be kids taken away from their parents. And actually Pueblo Sin Fronteras, who I worked with in the caravan, we’re working with cases of parents who because of totally bogus charges that are equivalent to like a “stop and frisk” type of things, from back in El Salvador, where unfortunately there’s a very, very high level of police abuse and completely inappropriate anti-gang tactics that have been trained into them by the United States. [The parents] end up having these charges from back in their home country, and for that reason they were flagged basically by Interpol and had their kids taken from them. That can still happen. And not only are we going to detain you during the time we have to screen to determine whether or not someone can advance with an asylum case. Typically, families and parents with children are released after that. And that typically lasts somewhere between two and four weeks or so, which is already pushing the limits of what’s called the “Flores Settlement,” which is a court decision that establishes certain protections for kids—immigrant children—against being detained. It puts limits on the amount of time. We interpret that they shouldn’t be detained and that a five-day maximum is really what’s allowed by the decision, and then the government interprets it as “under situation of crisis or surge or national security threat,” it’s up to 20 days. And so the government’s goal for family detention is to get people out within 20 days or so, although there’s many many exceptions to that. So what we’re looking at now is the government trying to attack the Flores Settlement, that court case that protects children from indefinite detention in a way that would allow them to detain children for as long as they want, with their parents. And it’s already been very clearly established through years of advocacy and investigation work, by not only the immigrant rights community but the pediatric community, and medical and psychological community, that family detention is also a very trauma-inducing, awful experience for children and parents. It’s not an alternative. What kind of medical services are these kids receiving in these centers? Are there any family reunification cases that you’re working on? The irony of the federal government asking for an original ID is that the federal government took her original ID from her when she crossed the border. But when another agency asks for it they don’t provide it. Then they wanted to do a DNA test. Finally this mother was able to get out and so she is not in immigration detention anymore, but she is still not together with her kids, because now they have to start the entire reunification, documentation process, again, with her as the sponsor. And at this point, we’re going on three months… that’s a very long time for those kids—especially [for] one of them [who] is two years old—to be separated from their mom. Not a single one of the cases of family separation, of which there are nine from this past caravan, has actually … been reunited. There’s been a couple of kids who have managed to get out of the Office of Refugee Resettlement with another family member, not a parent. But most of the adults who were separated with moms and dads, are still in immigration detention, and they very well may be denied parole by ICE, or given a bond. There’s $30,000-$20,000 bonds being issued by ICE right now, if they issue one at all. In many cases they just say, “You can’t leave. You’re detained here.” It’s a confusing process [that] involves multiple agencies that don’t communicate well with each other. It takes a long time, communicating with their kids is very difficult. There’s one father who has yet to speak to his kid two months after being separated from him. That child is five. The situation you describe sounds very bleak. Do you see a scenario where all of these families are eventually reunited? I guess I’d say a couple of things. One, I don’t have a lot of faith in the U.S. Government actually complying with this court order, but there was a lawsuit filed by the ACLU [American Civil Liberties Union] that resulted very recently—about a week and a half ago—in a court order by a judge who said, “You have 30 days to reunite all of these children with their parents.” And that will be coming up I think something like July 26, or so is the date that theoretically all of these kids should’ve been reunited with their parents. I don’t really see that happening. [According to various media reports, as of this time 650 children are still separated from their parents] And in a worse-case scenario, [one could see the government] opening up family detention centers and re-detaining children, that have already gotten out, with their parents indefinitely. I don’t really know what’s going to happen. But that’s one thing to keep an eye on, to figure out what’s going to happen with compliance with that court order. But given the current policy and current situation, the way to get families back together is to get the parents out of immigration detention. Unfortunately right now the government is arbitrarily denying many requests for release by people who are asylum seekers, who are not a flight risk, they’re not dangerous, which supposedly means that they meet the standards to be released. But ICE—under the current administration, even more so under the last administration—is just arbitrarily denying people the right to fight their claims and freedom under any circumstances. One [way to help] is to not let up pressure just because of a very insidious executive order that looks like it ends family separation but really doesn’t and that proposes family detention—which is not OK. Continue going out in the streets, calling your congress people, asking them to pressure. The Attorney General’s office of California, along with a number of others, also recently filed a lawsuit. I would say call the Attorney General Xavier Becerra, and let him know that you want him to fight against these policies, fight against the private prison industry, and also keep in mind that children being taken from their parents is just one form of family separation. The entire ICE immigration system is separating families as well. If you’re going to donate money, I would say donate money to organizations that are providing direct representation of people in immigration detention. It’s really important because that’s what helps people get out right now. Donating to bond funds, and going to a local immigration detention center. Here in Richmond, there’s an immigration detention center. There’s a rally every month outside the detention center. Get involved in that and you can visit and write letters. Actually today, some of the members of last years’ caravan, who have been released since going through part of their process, are all going to get together and write letters to people in immigration detention. Because sometimes people, even though their lives are at risk in their home country, if they have no contact with the outside world when they’re detained, they can give up and self-deport and that puts them in a very dangerous situation. So reach out to local organizations that are working with detained people. 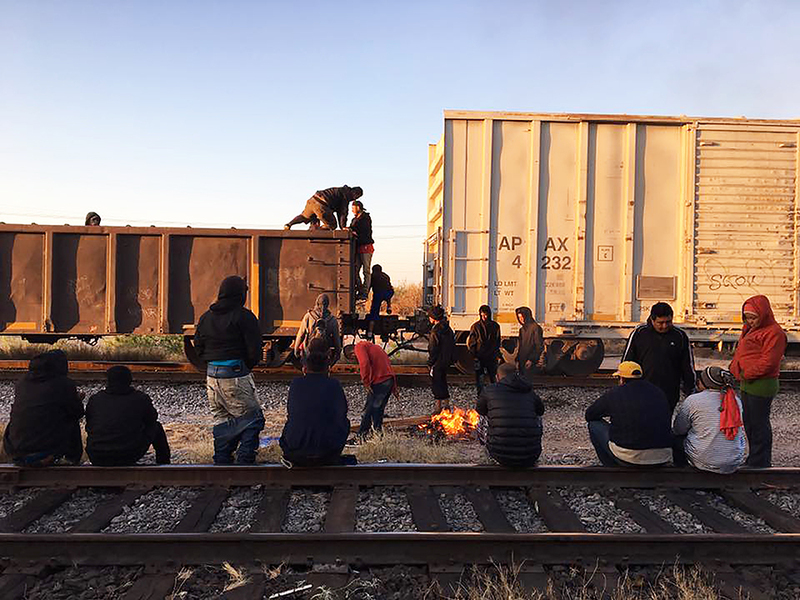 They can reach out to Pueblo Sin Fronteras, or by writing an email to RefugeeCaravan@gmail.com. They can look up, there’s a visitation program here at West County, the detention center in Richmond, that’s run by Freedom for Immigrants (formally known as CIVIC) and keep up the pressure. Can you tell us more about these larger detention centers? Otay Mesa Detention Center in San Diego is run by a company called CoreCivic, it used to be called CCA, Corrections Corporation of America. Their stock went astronomically up basically the day of Trump’s election, and the other large private prison company is GEO Group, they’re also the company that owns the subsidiary company that makes the GPS units that are used to shackle and monitor immigrants. This is all about money when it comes to the incarceration system. Money and far-right, anti-immigrant political agenda. They go hand in hand together.